We are a proud provider of Michelin tires because your safety is our top priority. Michelin is a word leader in tire manufacturing for not only safety, but fuel saving and longevity as well. That's the kind of quality and assurance that we pass onto you through our tire products and services! Whether you're in need of new winter tires for icy, snowy roads or require specialized tires for a high performance car, we have what you need. We carry Michelin, BF Goodrich or Uniroyal tires for cars, light trucks and performance tires for higher speeds, improved handling and maximum grip. 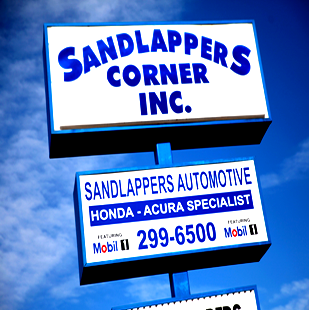 Our experts at Sandlappers Automotive are equipped with the expertise to give you the best advice on which tires are right for you, and how best to take care of them. With our wide selection of tires, computer balancing, shocks and brakes, you'll be able to enjoy the pleasure of driving with no worries about your safety or your vehicle's performance.